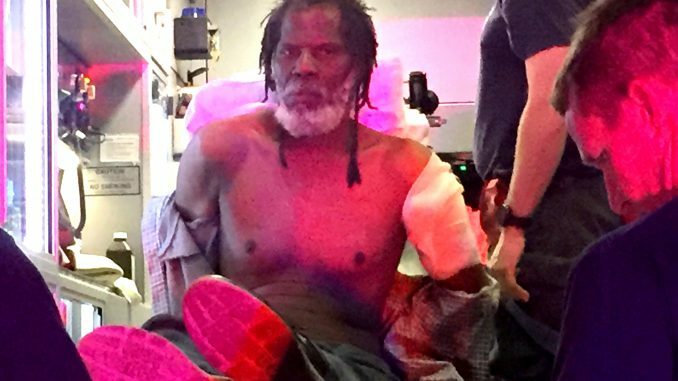 Burglary suspect Eugene Adkism sits in an ambulance after police found him in a Palo Alto home last night (Jan. 29). Post photo by Allison Levitsky. 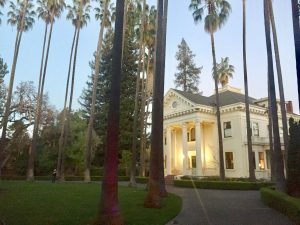 Police last night (Jan. 29) arrested a shirtless man on suspicion of burglary at the historic Squire House in Palo Alto’s Crescent Park neighborhood. At 5:08 p.m., a woman who lives in the mansion at 900 University Ave. arrived home and saw that her kitchen window had been smashed. She didn’t enter the house but called 911. Officers got there quickly and heard rustling sounds coming from upstairs. The Squire House at 900 University Ave. in Palo Alto. Post photo. They called out to the intruder, who then came downstairs and told officers it was his home, according to police. 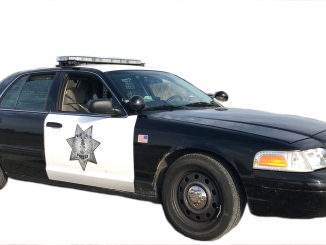 Police approached the man and, when he resisted officers’ commands, a police dog was used to take him into custody, police said. The man suffered minor injuries from his encounter with the police dog, according to police. As the three residents of the home watched, police walked the man outside in handcuffs. 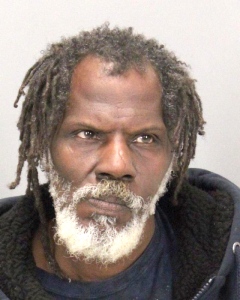 Eugene Adkism, 53 of San Jose, was arrested and booked into jail on charges of burglary, possession of stolen property and resisting arrest. Sgt. Craig Lee said there was “a lot” of broken glass in different locations in the house. For another 20 minutes, police continued to search the house and around 6:15 p.m., officers walked through the house with the residents. 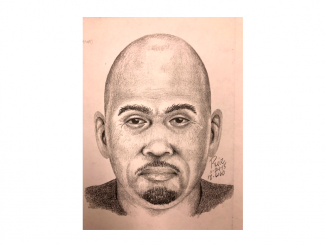 A neighbor told police that around 5:30 p.m., she saw another man in a full sprint, as if he was “running from something” at Hamilton Avenue and Chaucer Street, three blocks from the Squire House. Lee said it wasn’t clear whether that man had anything to do with the burglary. The Squire House was built in 1904 by John Adams Squire, a lecturer in classics at Stanford and a direct descendant of President John Adams, according to Palo Alto Stanford Heritage. Squire and his wife Georgiana hired San Francisco architect T. Paterson Ross to build their mansion at a cost of $18,000. The house, which has been historically preserved, is an example of the Classic Roman Revival style. It was last sold for $1.7 million in 1993. Real estate websites estimate its current value between $8.2 million and $15.8 million. I’m glad the police have dogs trained for situations like this.